After a 14-year hiatus from the studio, Hot Snakes have triumphantly kicked down the door back into our lives with their new album, Jericho Sirens. And amid the mania of non-stop political rhetoric, doom-and-gloom prognostications and omnipresent technology, it's not a moment too soon. Hot Snakes formed in 2000, after the release of their first record, Automatic Midnight. They were John Reis, Jason Kourkounis, Rick Froberg and Gar Wood. The band's sound represented a return to the unrealized past of its members. This time, their musics would be direct, undraped and rock ' roll while still maintaining the dense and turbulent character of the members' previous work. That year, Hot Snakes found their live sound and established themselves as primo, down-stroke warlords. They followed with a pair of great albums - 2002's Suicide Invoice, with drummer Jason Kourkounis, and 2004's Audit in Progress, with Mario Rubalcaba on drums - that broadened the band's sound while pleasing many a fan. However, the band eventually spiraled downward into a mid-life punk crisis, and by 2005 they had stopped performing. BUT! 2011 saw the return of Hot Snakes, with a string of festival shows. Both drummers performed with the band on the songs which they recorded, and the group discussed writing new material. 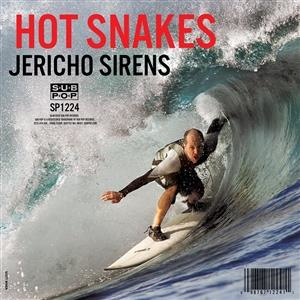 After an additional 6 years of discussions, Hot Snakes returned to the studio in 2017 to commence recording, and the results are, finally, revealed in Jericho Sirens. Musically, Jericho Sirens incorporates the most extreme fringes of the Hot Snakes sound (the vein-bulging, 78-second "Why Don't It Sink In?" the pounding downstrokes of "Having Another? "), while staying true to longstanding influences such as the Wipers, Dead Moon and Suicide on propulsive tracks such as "Six Wave Hold-Down," one of the first written for the project during a New Year's Eve 2017 session in Philadelphia. Other moments like the choruses of "Jericho Sirens" and "Psychoactive" nod to classic-rock titans such as AC/DC and Ozzy Osbourne, with Froberg admitting, "I'm as much a hesher as I am anything else, that's for sure." For Reis, reactivating his creative partnership with Froberg was one of the most rewarding aspects of the process: "Our perspectives are similar. Our tastes are similar. We work really well together. And what more is there to say? Rick totally outdid himself on this record, vocally and lyrically." Jericho Sirens was recorded in short bursts over the past year in Philadelphia and San Diego, with assistance from longtime bassist Gar Wood. Kourkounis and Rubalcaba, both of whom drummed on prior Hot Snakes releases but never on the same one, contributed throughout.